ULTRAMAX™ MF (Multi-Function) polishes slots, ribs, and intricate details with ease. Short stroke and fast reciprocation provide total control over the most demanding polishing tasks. Special control functions make any finish possible, letting you polish right up to a wall or finish to an edge. ULTRAMAX™ MF is unaffected by metal hardness. Even the toughest metals, including tungsten carbide and titanium, are no match. Everything from milled surfaces to rough EDM surfaces can be polished to a mirror finish. Use all grades of finishing stones, sintered, resin, and plated diamond tools, as well as ceramic stones, and metallic & nonmetallic lapping tools with diamond compounds. 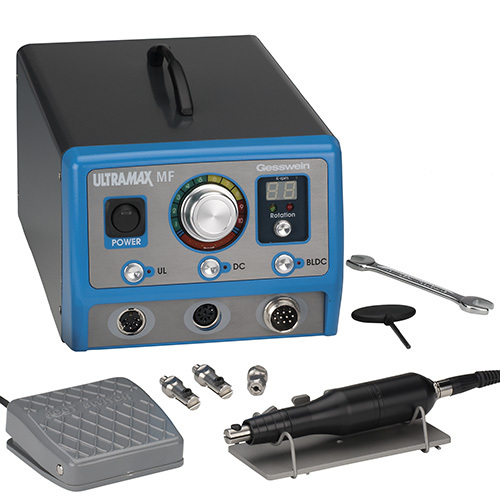 The Multi-Function ULTRAMAX™ MF gives you the versatility of ultrasonic and mechanical polishing in one package. The MF utilizes a high-efficiency microprocessor to deliver power to ultrasonic, brushless DC, and brush-type DC handpieces. Includes H26 Ultrasonic Handpiece with 36W of continuously variable power for precision reciprocating action. The DC output provides exceptional power to any of the Gesswein PowerHand rotary, reciprocating, side-to-side, or belt sander handpieces. The BLDC1 output provides high speed and high torque power to the optional Gesswein BH-60 brushless type rotary handpiece. The ULTRAMAX MF has a digital readout for power level reference on the DC outputs, and also a multi-color load indicator. Also featured is a forward/reverse switch for DC motor operation. 1. A brushless DC (BLDC) motor is a synchronous electric motor powered by direct-current (DC) electricity and having an electronic commutation system, rather than a mechanical commutator and brushes. In BLDC motors, current to torque and voltage to rpm are linear relationships. 2. Optional variable speed foot rheostat is also available, sold separately. Optional BH-60 Rotary Handpiece is a brushless rotary handpiece for the BLDC outlet. High speed with high torque. Supplied with 1/8" collet. A reducing collet may be purchased separately to allow this handpiece to run 3/32" tools.